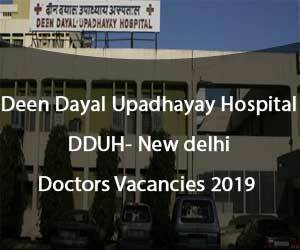 New Delhi: Deen Dayal Upadhyay Hospital (DDU New Delhi), New Delhi released 20 vacancies for the Junior Resident post on a Regular Basis. The selection will be done through a walk-in-interview. A walk-in-interview for engagement of Junior Residents will be held in DDU Hospital on 23rd April 2019. All eligible candidates who are interested for the same are requested to report at 9.00 a.m. on 23rd April at 1st Floor Administrative Block, DDU New Delhi along with duly filled Performa annexed with this notice, a set of self-attested copies of all certificates as per the checklist annexed and two passport size photographs. Original certificates/documents are also required at the time of interview for verification. Candidate’s reporting after 11.30 a.m. will not be considered for the interview. Only those candidates are required to report who fulfill the eligibility criteria as follows. Qualification: MBBS or equivalent degree from an MCI recognized university/Institute. Foreign Graduates must have cleared FMG examination. The candidate must not have done junior residency of one year from any recognized institute. Age limit: For General candidates 30 years as on date of Interview relaxable for SC/ST by 05 years and for OBC (Delhi only) by 03 years. OBC candidates are required to submit their caste certificate issued by the Competent Authority of GNCT of Delhi. The certificate should mention their belonging to non-creamy layer. Pay Scale: As per Pay Matrix, at Level 10 (Rs. 56100-177500), Plus usual allowance as admissible under the rules. Internship: Must have completed one-year rotatory internship/passed FMG Examination within one year from the Date of Interview (i.e. on or after 23.04.2018). DMC Registration: Valid DMC registration is mandatory for joining and in case of non-submission of valid DMC registration within the prescribed time limits; the offer of appointment is liable to be withdrawn. 1. 3% seats shall be reserved for physically handicapped persons as per the rules. 2. Number of the vacancies is provisional and subject to change without any notice. 3. Appointment will be initially for a period of six months extendable up to maximum of one year on the basis of satisfactory work & conduct report from the concerned HOD and written request from the Doctor concerned. 4. Pay Scale: As per Pay Matrix, at Level 10 (Rs. 56100-177500), Plus usual allowance as admissible under the rules. 5. The candidates who have already worked as Junior Resident for one year shall not be eligible. 6. In case, SC/ST/OBC candidates are not available for JR, the post shall be filled on Adhoc basis from General Category Candidates and vice versa. 7. The appointment and services will be governed under Residency Scheme of Govt. of India. 8. All appointments shall be subject to medical fitness and verification of certificates of educational qualification/age/caste/submission of valid DMC registration certificate and internship completion certificate etc. 9. Benefit of reservation will be granted only on the basis of caste certificate issued by the competent authority and production of original certificate at the time of interview. 10.Jurisdiction of Dispute: In case of any Legal dispute, the jurisdiction of Court will be Delhi/New Delhi only. 1. Only those candidates may appear who fulfill the above criteria and have necessary documents with them. Originals will also be required to be produced at the time of interview. All interested candidates are advised to download the application form along with check list for appearing in interview as no application form will be provided at the time of interview. 2. If any declaration Information furnished by the candidate is found false/any material/fact suppressed willfully, the candidate appointment will be cancelled/terminated. 3. The decision of the selection board/Medical Director of DDU Hospital regarding selection will be final and binding and no representation will be entertained in this regard.